Available in a range of 6 colours Banana Banner is double grommeted every 2 foot (610mm). 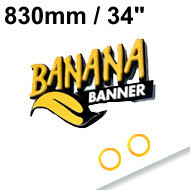 Simply roll out the banner material and cut between the patented “Double-Grommet” spacing, this will allow you to conveniently cut off the length required and have a grommet both at the ends of your first banner and the start of your second banner off the roll.The top and bottom have a 1 inch hem which are thermo-sealed. Banner material is 14oz / 396 g/m2. Multiple length orders are sent on one continuous roll. Pricing is per 2ft length eg. 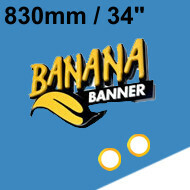 8ft long banner would be 4 lengths. 530mm/22in high. 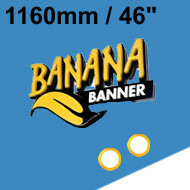 Price per 2ft / 610mm length. Price for 1 - 4 £2.85 ea. Price for 5 - 9 £2.55 ea. Price for 10 - 19 £2.35 ea. Price for 20+ £2.15 ea. Price per 2ft / 610mm length. 830mm/34in high. Price per 610mm / 2ft length. Price for 1 - 4 £3.71 ea. Price for 5 - 9 £3.31 ea. Price for 10 - 19 £3.05 ea. Price for 20+ £2.79 ea. 1160mm/46in high. Price per 610mm / 2ft length. 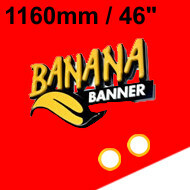 Price for 1 - 4 £4.57 ea. Price for 5 - 9 £3.95 ea. Price for 10 - 19 £3.69 ea. Price for 20+ £3.29 ea.